In his will, Jacob Haish specified that he desired his funds to provide a library and a hospital for his beloved DeKalb. His remaining wealth would prove to stretch far; The Haish Memorial Library (DeKalb Public Library,) the former DeKalb Public Hospital (Barb City Manor) and the emergency wing at Kishwaukee Hospital (Northwestern Medicine) were established due to his philanthropy. 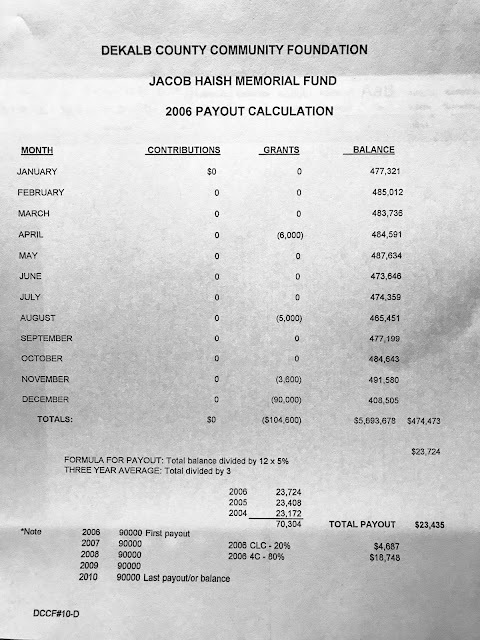 These donations were possible not only because of Haish's money, but because of a group of locals who determined where the money would go, and how it would be handled. That group, first formed in 1952, was the Jacob Haish Memorial Hospital Corporation board. 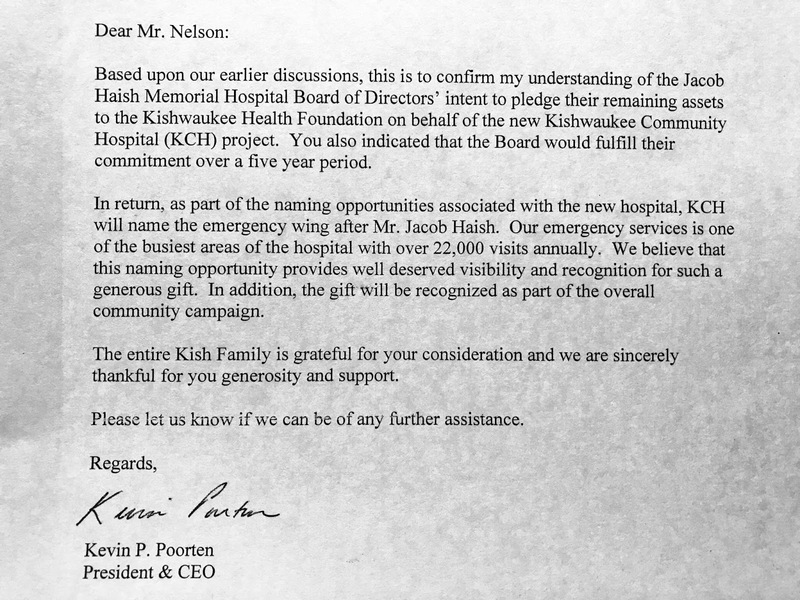 The memorial group "quietly over the years made grants totaling $2.5 million to projects board members felt satisfied the intent of Haish's will," according to a 2006 Kishwaukee Hospital news release. On top of the hospitals and the library, the group gave grants to Community Coordinated Child Care (4-C) and Children's Learning Center. 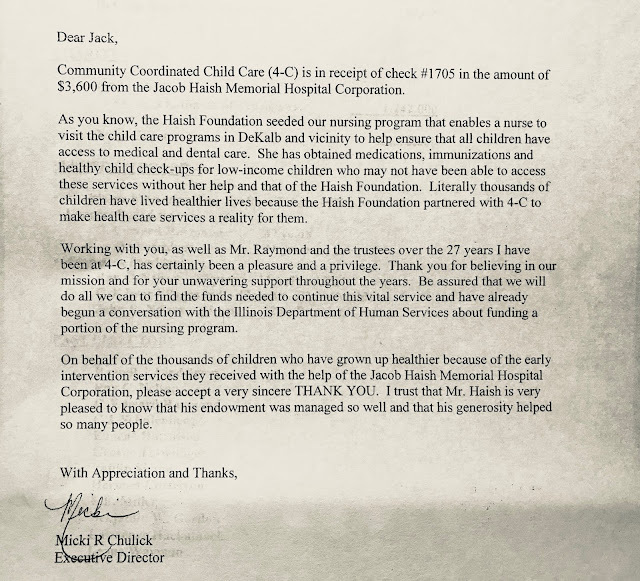 John "Jack" Nelson, the most recent president of the Haish Memorial Corporation, said they would also occasionally pay hospital bills for people in need. "The board met as needed, maybe two to three times a year," Nelson said. "We would accumulate 10-12 hospital bills that needed payment, and have a meeting to talk about it." Nelson said that in order to spend money, the group needed court approval each time, by filling out a "cy pres" petition. "I think we were quite conservative in protecting the estate," Nelson said. The biggest "denial" for a money request? Haish's distant family members who were looking for a payout. They would not receive a dime, due to a line in Haish's will that explicitly said "I have purposely refrained from making any bequests to any of my relatives for the reason that I have from time to time during my life made such gifts to them as I desire them to have." "He had already taken care of the family," said Gordon Melms, a longtime memorial board member. For years, the group also paid to put flowers on Jacob and Sophia's gravesite in DeKalb. That stopped when the money in the foundation was gone. 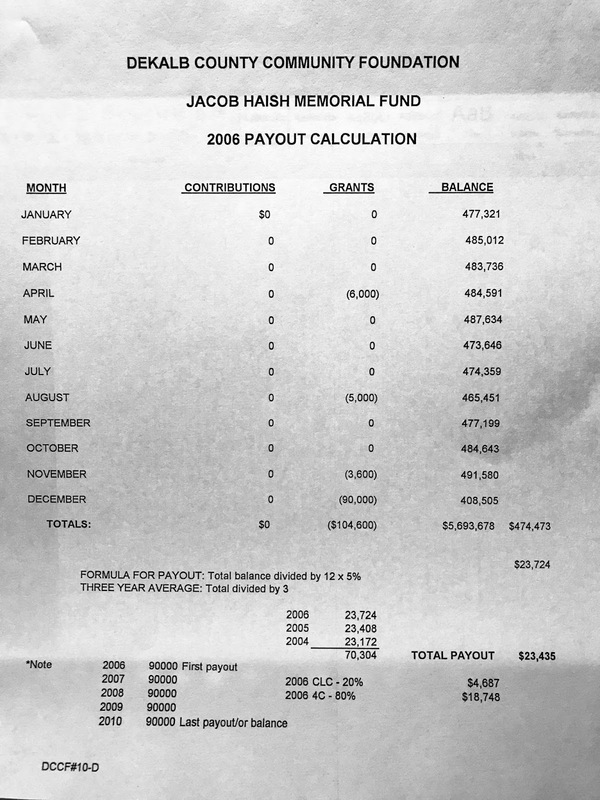 "If you think about it, because of his money, Jacob lived almost another 100 years," said Haish family descendant Jennie Marshall Cummings. 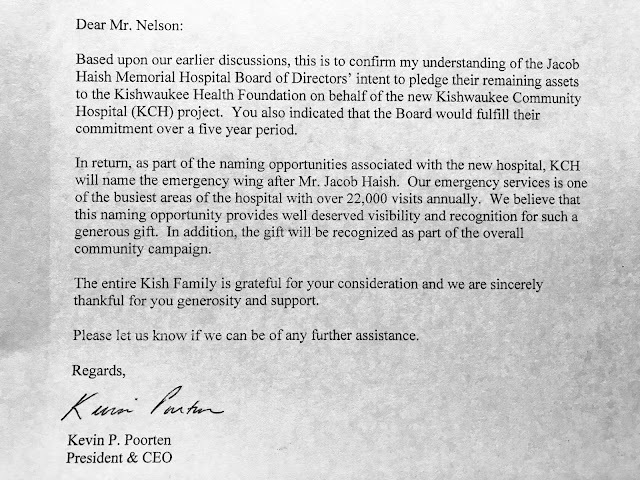 The final dollars, a total of $450,000, went toward the emergency wing at the Kishwaukee Hospital. "We put [the memorial board] out of business with that donation," Nelson said with a laugh. "Because the money was gone." Melms said the group, along with the DeKalb County Community Foundation, were instrumental in ensuring that the estate helped as many people as possible. He said many of the members stuck with the group because it had such an important impact. "I didn't know Jacob, but I admired him," Nelson said. "Jacob did a lot for the community. We felt we were doing something beneficial to the community. It's gratifying to say we've done what we think is best for the community, and what Jacob would have wanted."